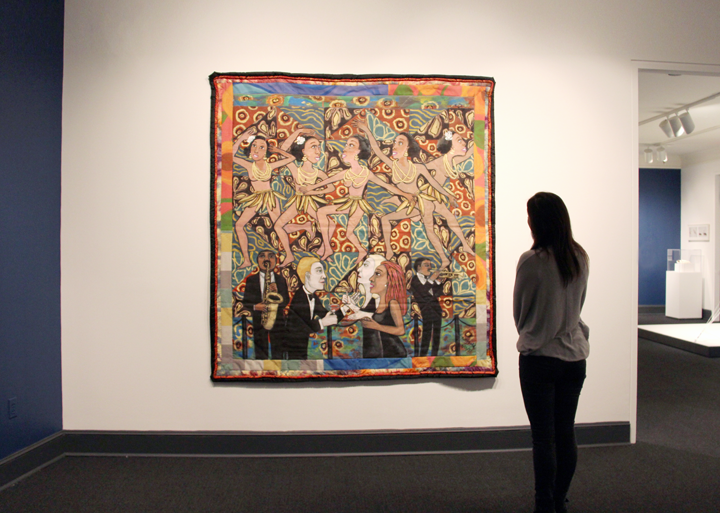 Artists May Stevens and Faith Ringgold highlight other prominent women artists through paintings currently on display in the museum’s third-floor galleries. Stevens and Ringgold chose their subjects for their impact on the arts as well as broader social issues. Stevens’s SoHo Women Artists and Ringgold’s Jo Baker’s Bananas share common themes: women celebrating women, artists honoring artists, and women reclaiming their places in history. In SoHo Women Artists (1978), Stevens includes a self-portrait along with depictions of artist Miriam Schapiro and critic Lucy Lippard—two other members of the collective and feminist journal Heresies: A Feminist Publication on Art and Politics. 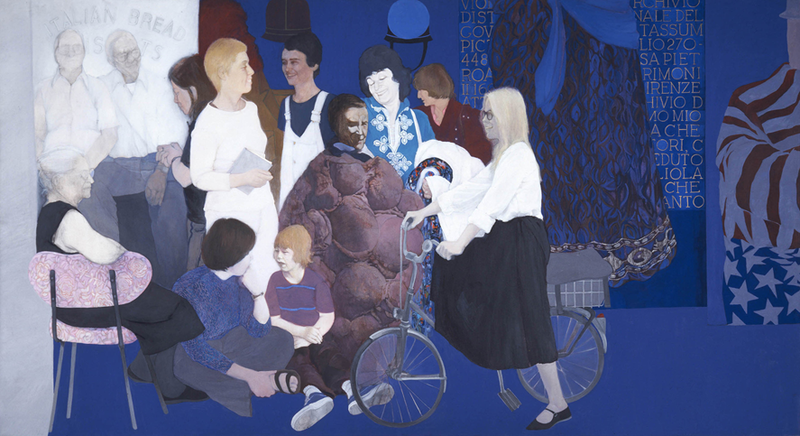 In addition, Stevens depicts other friends and neighbors who helped shape the 1970s feminist art revolution in New York City, including artists Harmony Hammond, Joyce Kozloff, Louise Bourgeois, and Sarah Charlesworth. Stevens’s frieze-like composition is reminiscent of traditional western history paintings, which praised important thinkers but often excluded women. Through depictions of her contemporaries, Stevens emphasizes her friends’ influential roles in advancing the feminist movement. Working from candid snapshots of her friends, Stevens captures their respective personalities. Although each figure is distinct, they are layered to form a cohesive unit. Overall, the monumental painting embodies a sense of collaboration, friendship, and celebration. Ringgold’s Jo Baker’s Bananas (1997) honors the world-famous dancer Josephine Baker (1906–1975), who gained renown in her adoptive country of France during the 1920s. Ringgold captures Baker’s vivacious personality through five iterations. Each of the five portrayals shows Baker with a wide smile, expressive gestures, and costumed in her iconic skirt made up of artificial bananas. The overlapping, sequential arrangement of the figures across the canvas makes it seem as though Baker is in motion, performing one of her signature dances. Through these images, along with depictions of musicians, audience members, and boldly colored patterns, Ringgold creates an atmosphere of celebration. Jo Baker’s Bananas references nostalgia for the jazz age, but also pays homage to Baker. Upon her return to the U.S., Baker refused to perform for segregated audiences and became a civil rights leader. Ringgold has portrayed Baker several times, including in the painting Jo Baker’s Birthday and the mosaic mural Flying Home Harlem Heroes and Heroines. Because women artists have often been overlooked and ignored in the history of art, it is rewarding to see women artists celebrated by other women artists. May Stevens and Faith Ringgold recognize and praise the significant social and artistic contributions made by other great women. This entry was posted in From the Collection and tagged Faith Ringgold, Jo Baker’s Bananas, Josephine Baker, May Stevens, SoHo Women Artists by Women in the arts. Bookmark the permalink.